Moles are very common on skin. A small mole near lip adds to beauty of face. But when they become big and protrude out of skin, they are unsightly. They can be easily removed with radiofrequency machines. Radiofrequency unit working at 3.8 MHz is used for Radio surgery. It can be used for various skin growths like- Moles, Warts, Molluscum, Skin tags, Seborrhoeic Keratoses, Xanthelasma. Keloid , Sebaceous Cysts and Skin cancers, etc. 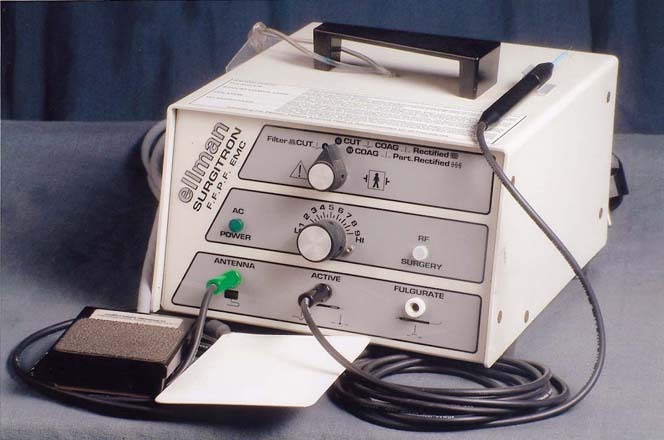 It is also used for Acne-Scar resurfacing surgery. Because of peculiar 'cut-coagulation' mode, bleeding during procedure is minimum. Hence it can also be used for vascular growths. Cosmetic end results are excellent with Radiosurgery. It is a simple, rapid, stitchless, OPD procedure, usually requiring local anaesthesia. Small lesions does not require anesthesia. Hence many lesions can be operated at same time.